Five Keys to Staying Visible While Riding | Hupy and Abraham, S.C. 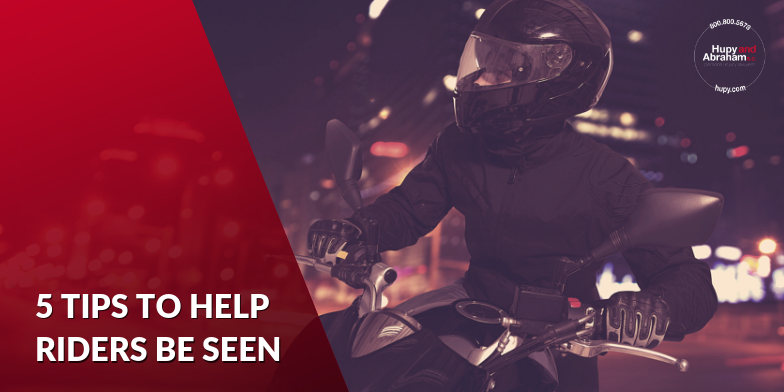 It happens all too often that bikers are struck by motorists who simply “didn’t see them.” With motorcycles being significantly smaller and less noticeable than typical vehicles, drivers often fail to see them on the roads leading to serious accidents. As a rider, it is important to make yourself as visible as possible while on the road to help decrease the chances of being hit by an inattentive driver. Here are five easy-to-follow tips to help make bikers more visible. Use your lights. Using the high beam during the day may seem like an unnecessary precaution, but this can greatly increase your visibility to motorists. Additionally, repeatedly tapping your brakes when coming to a stop will flash your taillights, giving a more noticeable indication of your presence to any drivers behind you. Wear bright reflective clothing. While black leather may be the preferred fashion of the riding community, reflective and high-visibility clothing is essential to keep you seen while riding. These will increase your visibility during the dark of night, beyond simply using your headlights. Carefully consider the conditions. It’s essential to consider the weather conditions before even getting on your bike. Riding in heavy fog can make you invisible and using your high beam will do more harm than good. In serious conditions, it may be a good idea to pull over and wait out the poor conditions or stop for the night altogether. Drive smart. Always position yourself in your lane to be most visible. Take note of the vehicles around you on multilane roads and ensure you’re positioned in a place that maximizes your visibility to surrounding drivers. Additionally, be on your best behavior on the roadways – make eye contact with other drivers before going through an intersection, always use your turn signal even when it seems unnecessary and only beep your horn when needed to avoid distracting other motorists. Assume you’re invisible. It is always safest to ride under the assumption that you are invisible and act accordingly. This will help you form a defensive riding style that will maximize your overall safety. It’s key to ensure that drivers around you can see you and always be prepared to react quickly when they don’t. If you or a loved one has been injured in a motorcycle accident, it is important to seek legal representation.